NEW YORK, NY.- The palace of Versailles has attracted travelers since it was transformed under the direction of the Sun King, Louis XIV (1638–1715), from a simple hunting lodge into one of the most magnificent public courts of Europe. French and foreign travelers, royalty, dignitaries and ambassadors, artists, musicians, writers and philosophers, scientists, Grand Tourists and day-trippers alike, all flocked to the majestic royal palace surrounded by its extensive formal gardens. 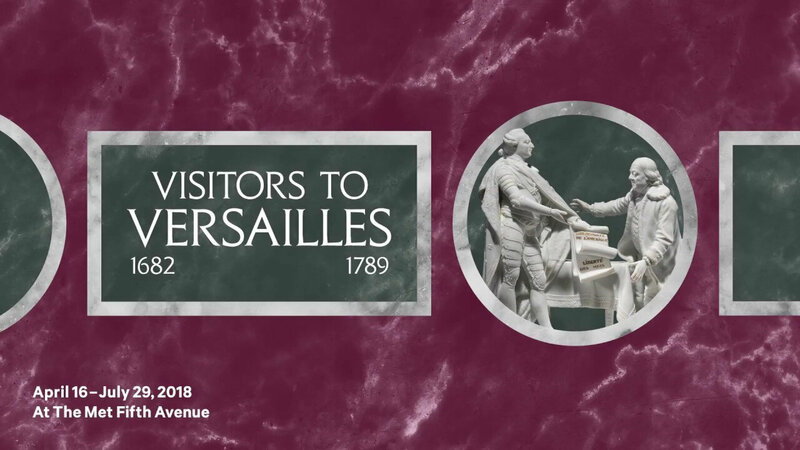 Opening April 16 at The Metropolitan Museum of Art, Visitors to Versailles (1682–1789) tracks these many travelers from 1682, when Louis XIV moved his court to Versailles, up to 1789, when Louis XVI (1754–1793) and the royal family were forced to leave the palace and return to Paris. 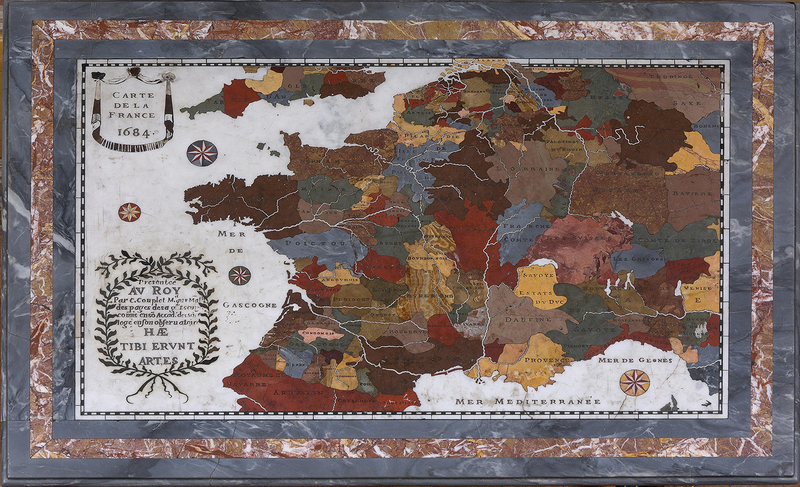 Versailles was always truly international and surprisingly public. Countless visitors from around the world were welcomed at the palace. 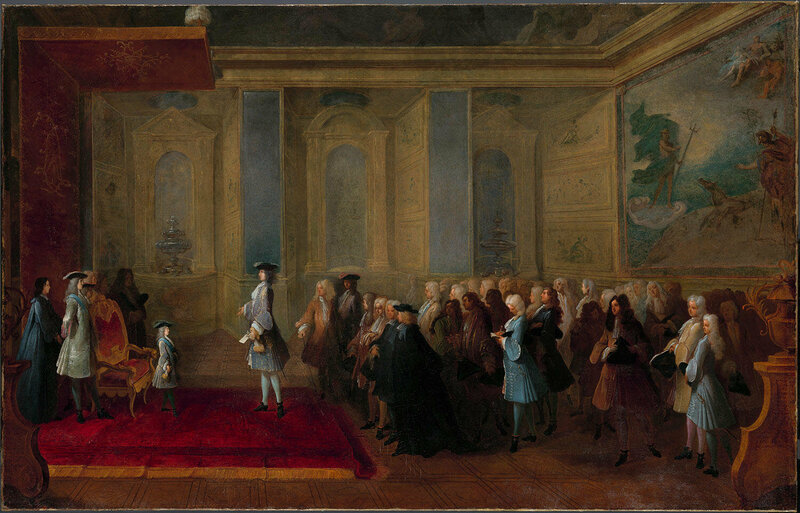 The openness reflected both a long French tradition of granting the king’s subjects access to their sovereign and a politically calculated display of the French State’s power and wealth. Many visitors described their experiences and observations in correspondence and journals. 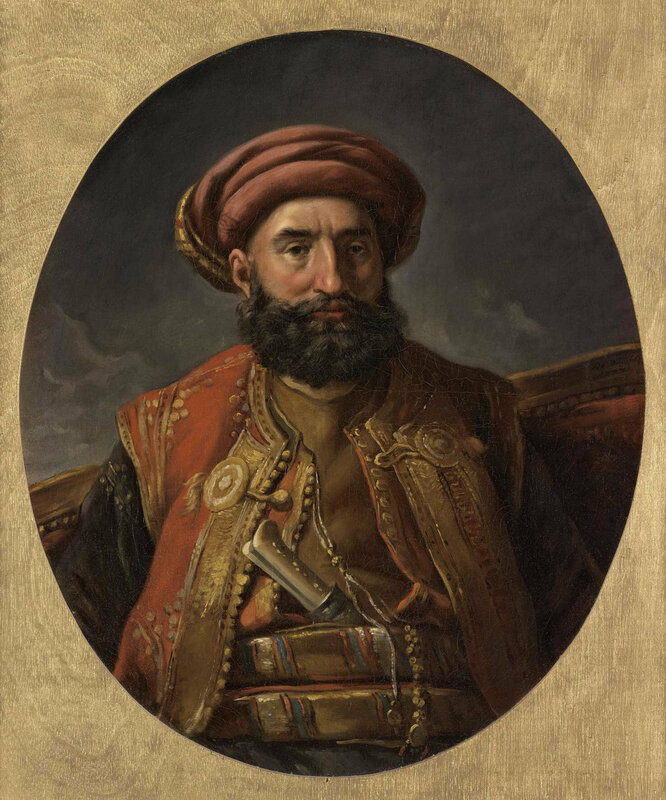 Court diaries, gazettes, and literary journals offer detailed reports on specific events and entertainments as well as on ambassadorial receptions that were also documented in paintings and engravings. Armchair, ca. 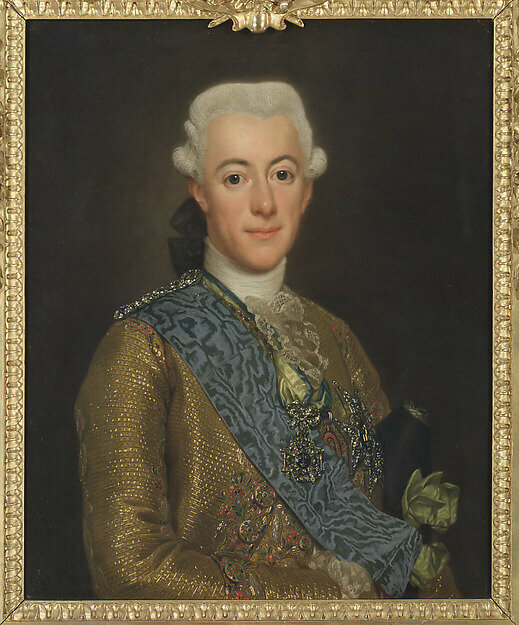 1700–1710. 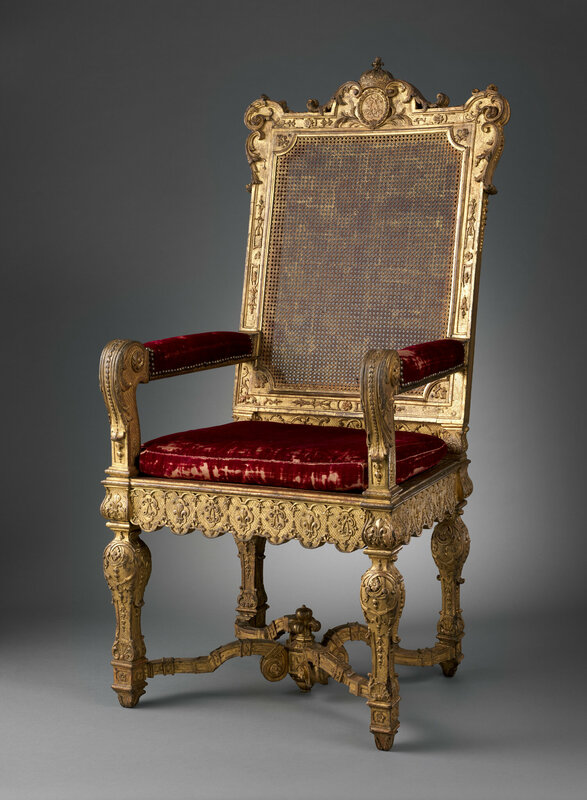 Carved and gilded walnut, caning; velvet, 144.8 × 70.2 × 71.1 cm. 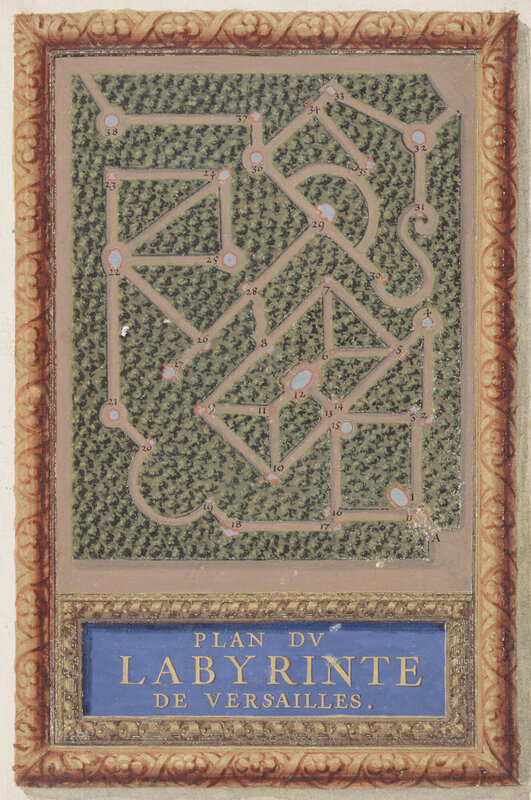 Gift of J. Pierpont Morgan, 1917 (17.190.1738) © 2000–2018 The Metropolitan Museum of Art. 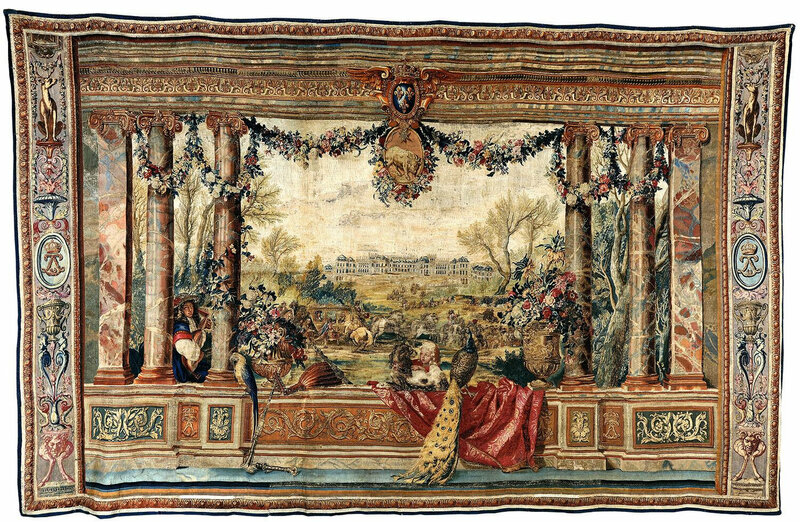 Exhibition visitors will first encounter a large Gobelins tapestry dating to 1673–77. 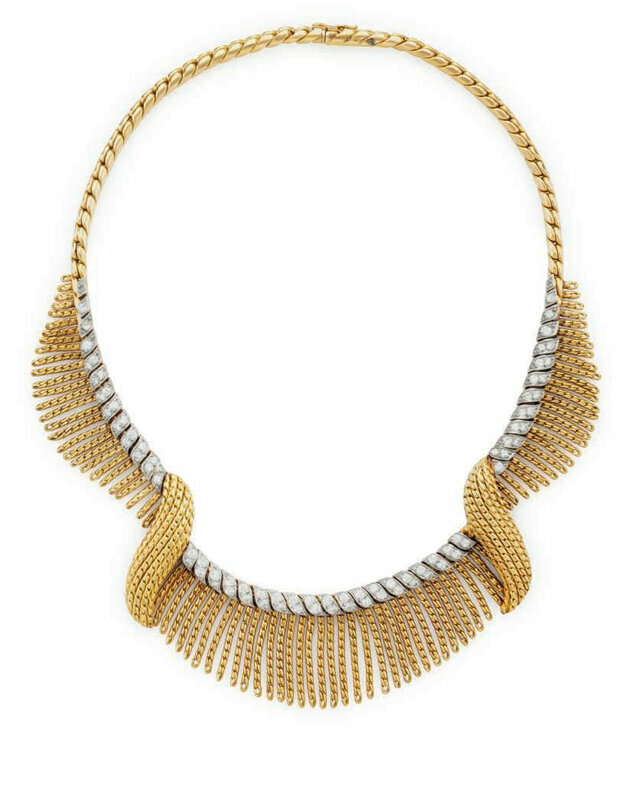 Woven with shimmering gold and silver threads, it depicts the king riding in his carriage toward the palace. The following galleries capture the modes of transportation to Versailles and the French code of dress. 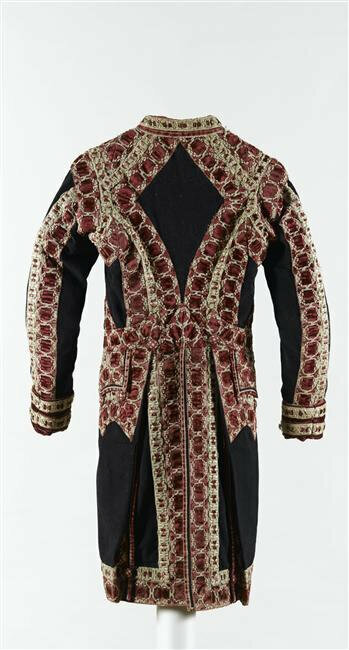 Among the reasons to visit the royal residence were its extensive gardens and the prized opportunity to catch a glimpse of the king. 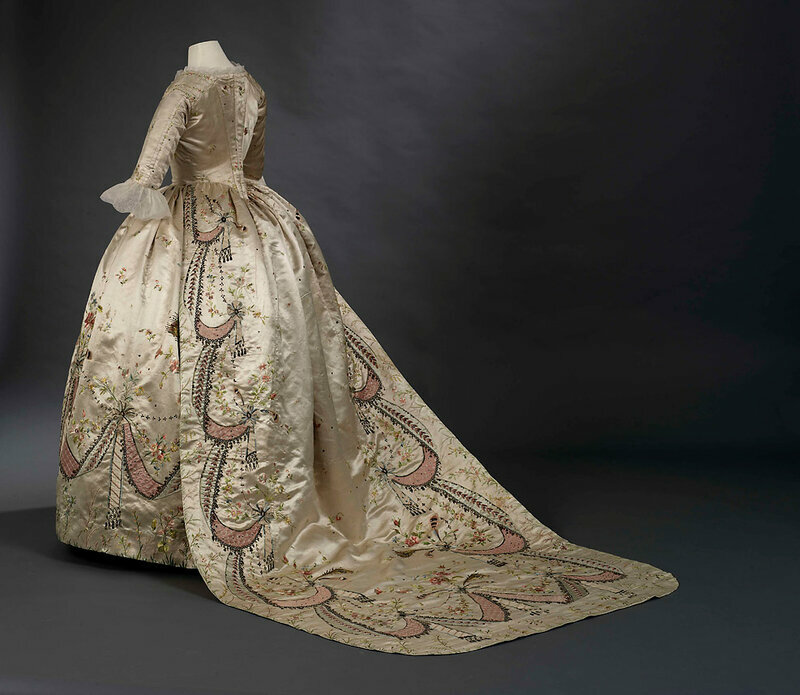 Highlight works include a beautiful robe à la française believed to have been worn by the wife of renowned textile manufacturer Christophe-Philippe Oberkampf for her audience with Marie Antoinette, three animal sculptures that were once part of the fountains in the Labyrinth, and uniforms and weapons of the king’s household. 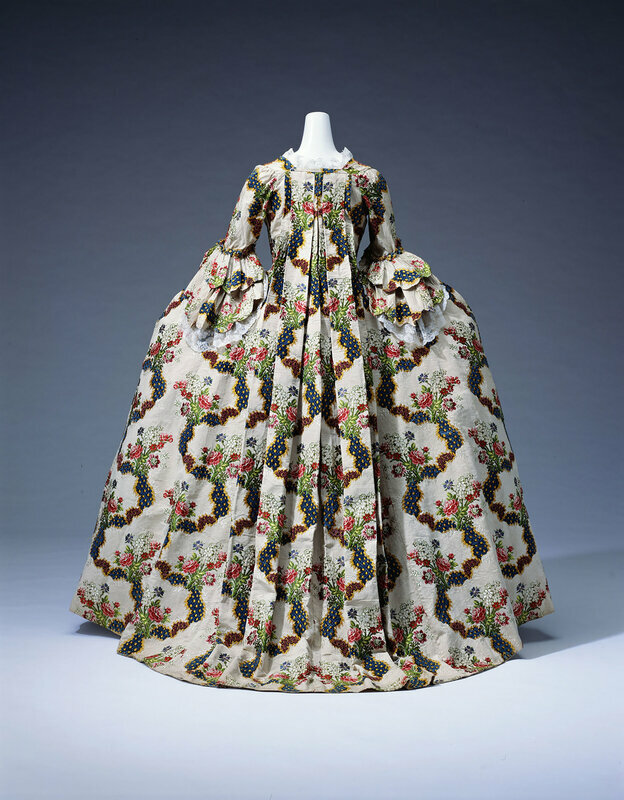 Court Suit, French, 1774–93, silk, Rogers Fund, 1932 (32.40a–c) © 2000–2018 The Metropolitan Museum of Art. 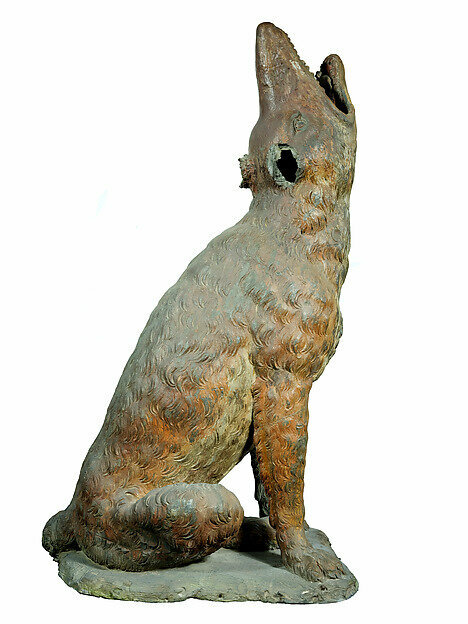 Benoît Massou (French, Richelieu, Indre-et-Loire 1627–1684 Paris), Wolf, 1672–74. 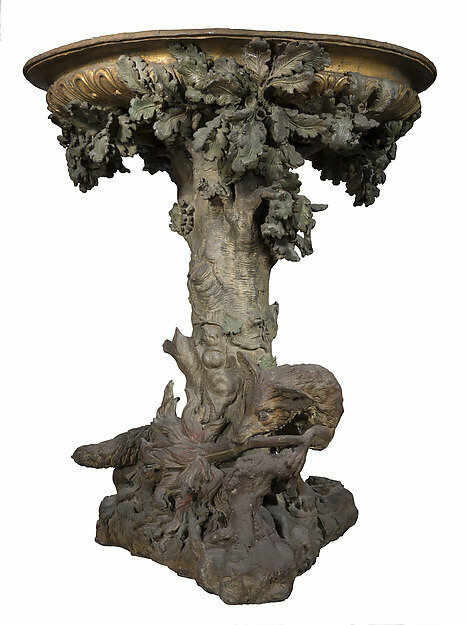 Painted lead, 89 × 35 × 61 cm, 150 kg, Musée National des Châteaux de Versailles et de Trianon (MV 7181) © RMN-Grand Palais/Art Resource, NY, photo by Didier Saulnier. 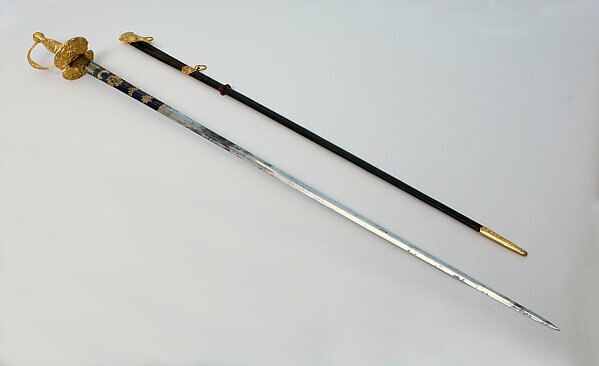 Partisan Carried by the Bodyguard of Louis XIV (1638–1715, reigned from 1643), Paris, ca. 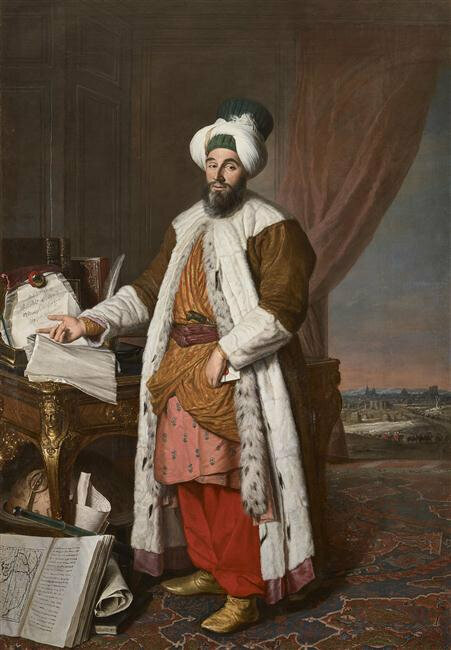 1658–1715. 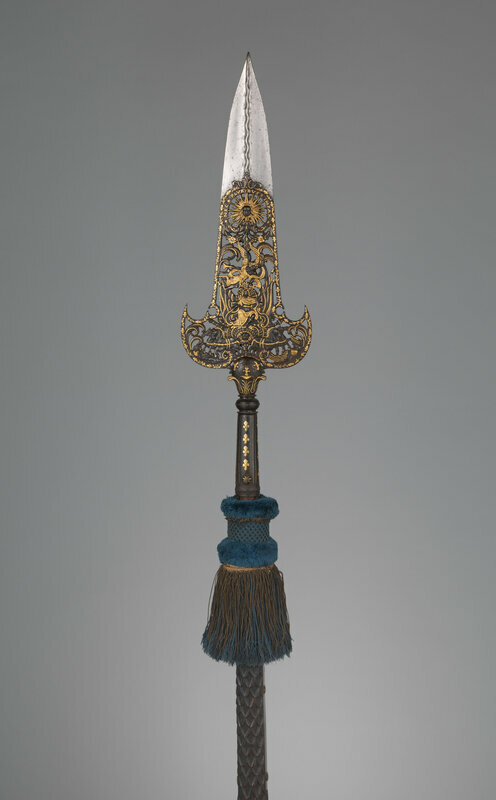 Steel, gold, wood, textile, brass; Rogers Fund, 1904 (04.3.64) © 2000–2018 The Metropolitan Museum of Art. 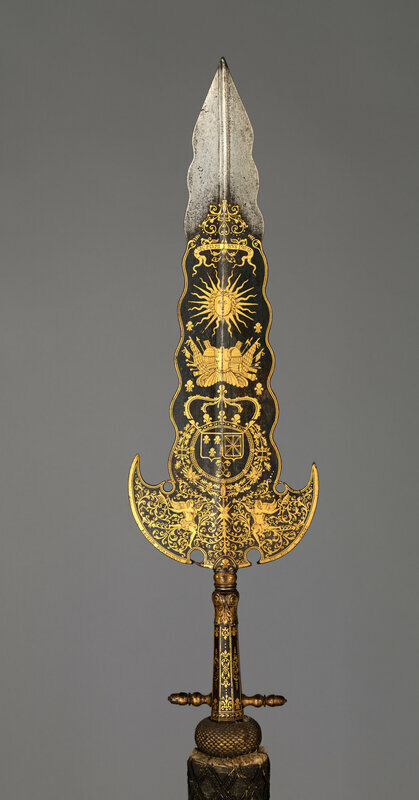 Partisan Carried by the Bodyguard of Louis XIV (1638–1715, reigned from 1643), Inscription probably refers to Bonaventure Ravoisie (French, Paris, recorded 1678–1709), Paris, ca. 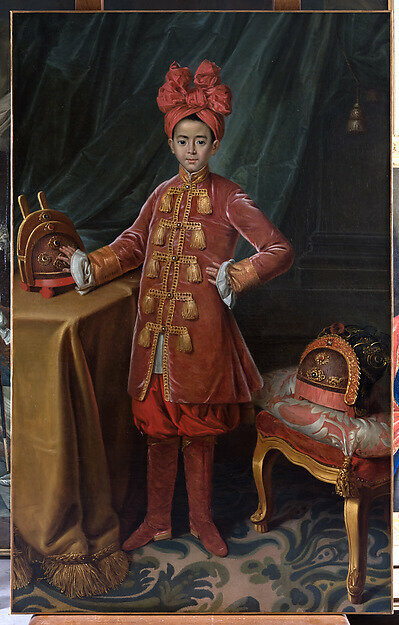 1678–1709. Steel, gold, wood, textile, brass; Rogers Fund, 1904 (04.3.65) © 2000–2018 The Metropolitan Museum of Art. 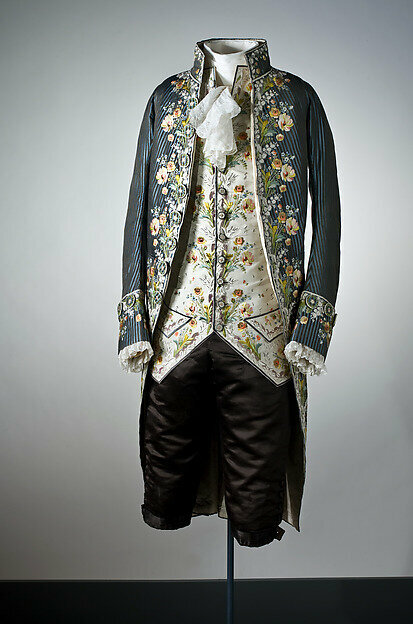 Partisan Carried by the Bodyguard of Louis XIV (1638–1715, reigned from 1643), Jean Berain (French, Saint-Mihiel 1640–1711 Paris), Paris, ca. 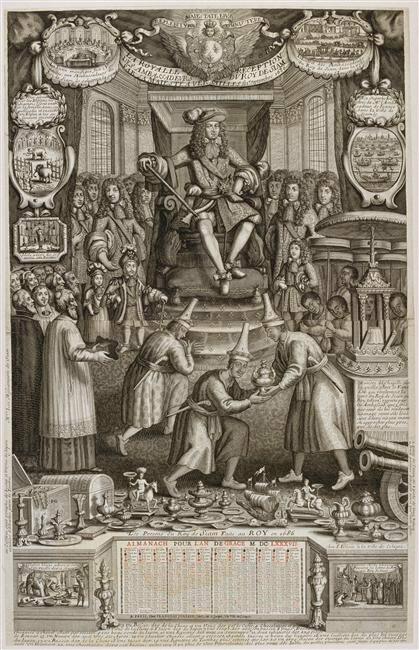 1679. Steel, gold, wood, textile; Gift of William H. Riggs, 1913 (14.25.454) © 2000–2018 The Metropolitan Museum of Art. 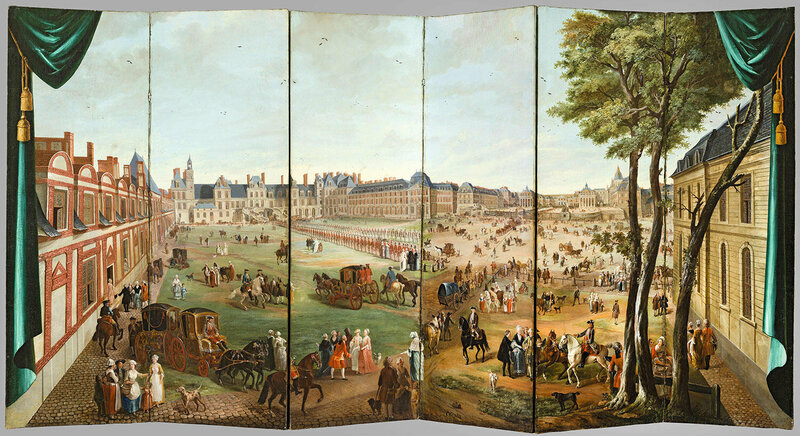 A number of Americans journeyed to Versailles, either as tourists or diplomats. 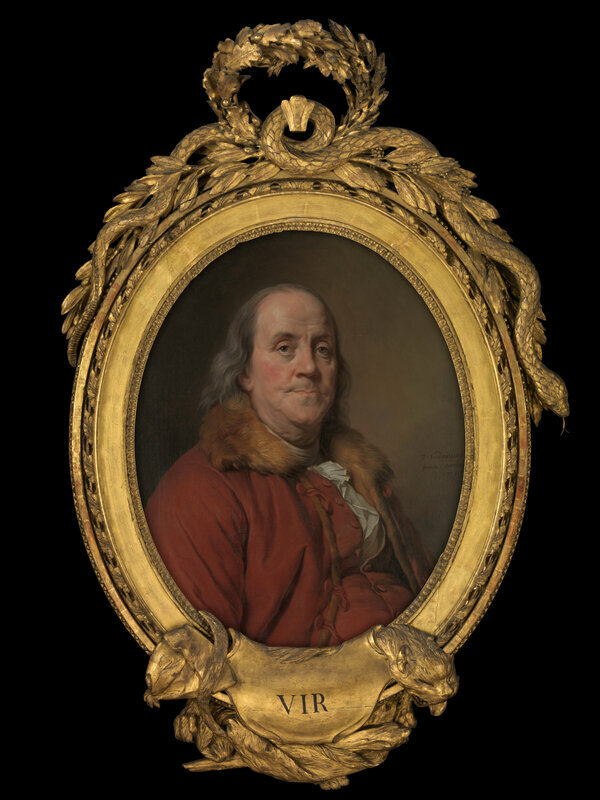 Benjamin Franklin first visited Versailles in 1767 and played a significant role especially after 1776, when France became the colonists’ only military ally in their rebellion against Great Britain. 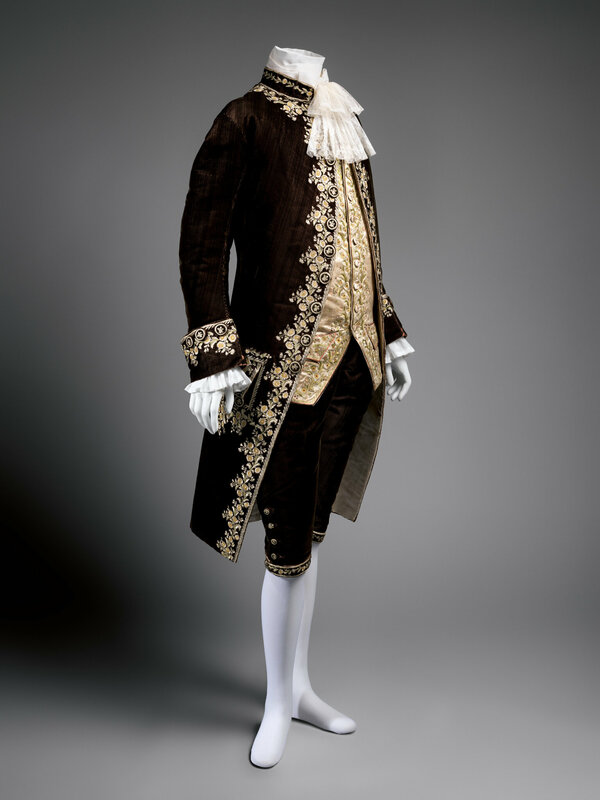 Franklin captivated the French, shamelessly playing to their expectations of Americans, forgoing a wig and dressing in plain, unadorned clothes. 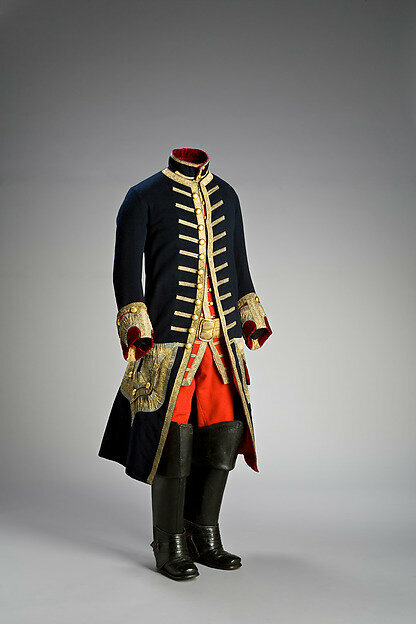 The exhibition features one of Franklin’s suits, on loan from the Smithsonian’s National Museum of American History and rarely displayed to the public, as well as his portrait by Joseph Siffred Duplessis and French commemorative porcelain. 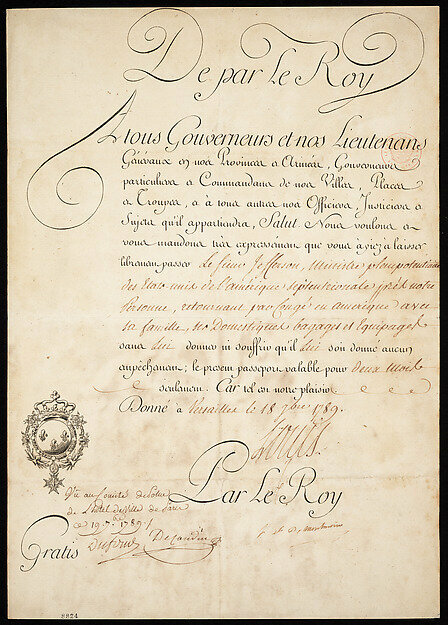 Also displayed are Thomas Jefferson’s passport signed by King Louis XVI and a gold-hilted sword presented to John Paul Jones. Joseph Siffred Duplessis (French, Carpentras 1725–1802 Versailles), Benjamin Franklin (1706–1790), 1778. Oil on canvas, Oval, 28 1/2 x 23 in. 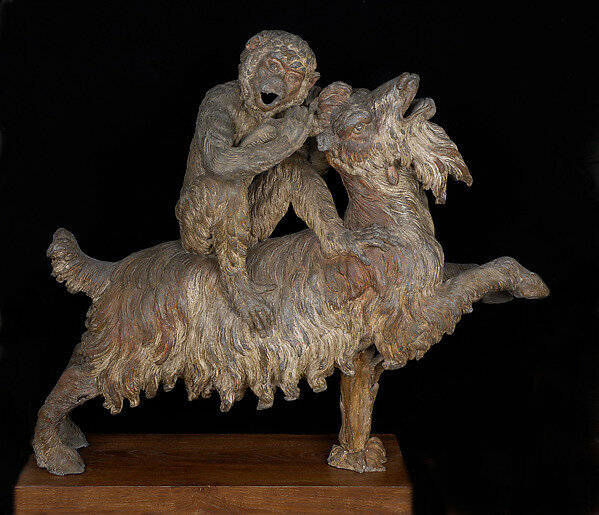 (72.4 x 58.4 cm),The Friedsam Collection, Bequest of Michael Friedsam, 1931 (32.100.132). 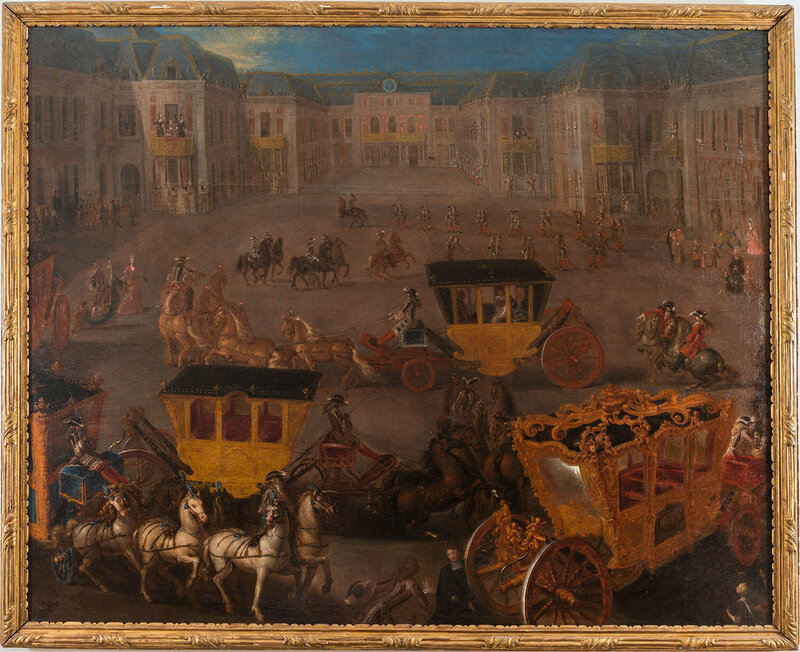 The exhibition concludes with the dramatic events of October 1789, when an angry mob forced the royal family to return to Paris. 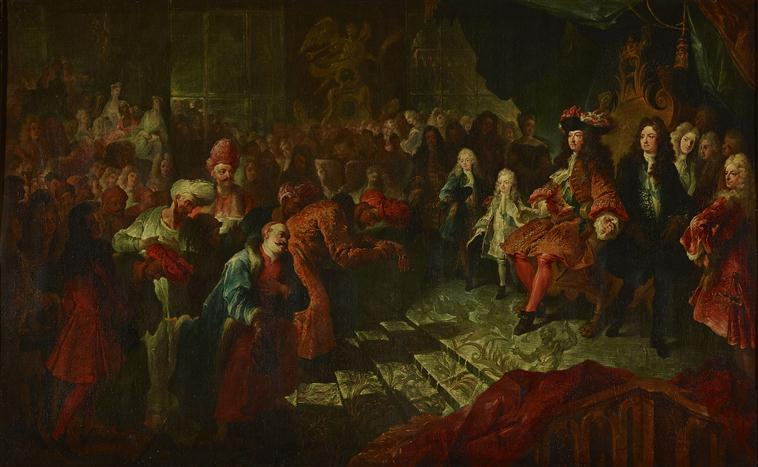 Upon visiting the abandoned palace in June 1790, Russian writer Nikolai Karamzin poetically compared Versailles without a court to a body without a soul. 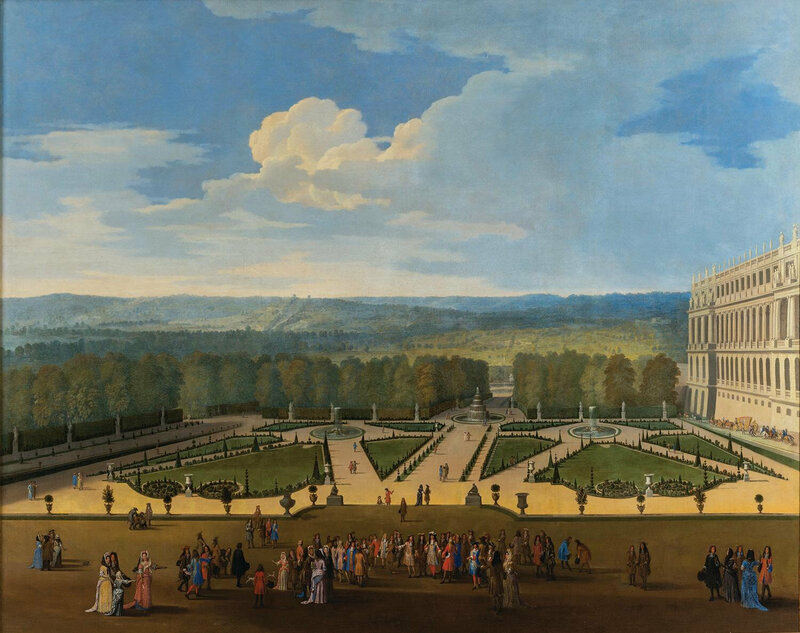 Yet his written reflection on the experience—“I have never seen anything more magnificent than the palace of Versailles”—is a testament to visitors’ enduring fascination with the former royal residence, even to this day. 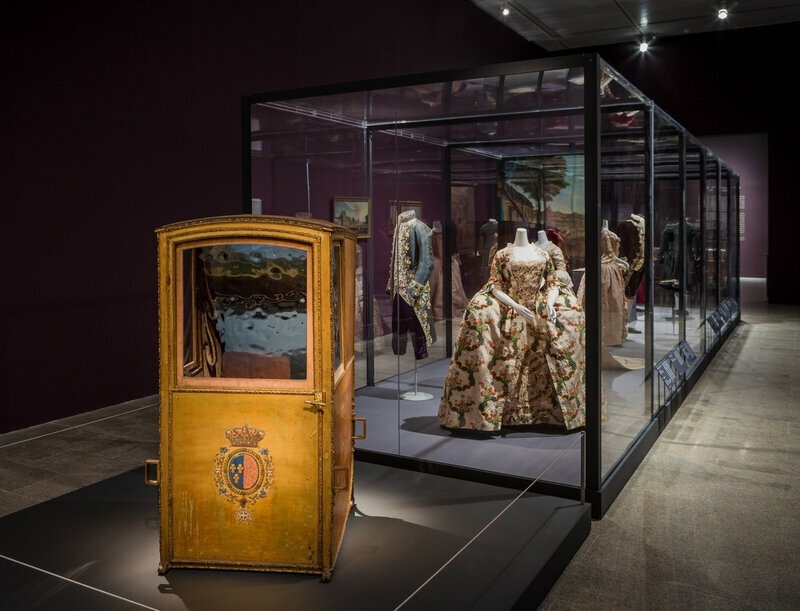 The exhibition design is meant to evoke the grandeur and opulence of Versailles. 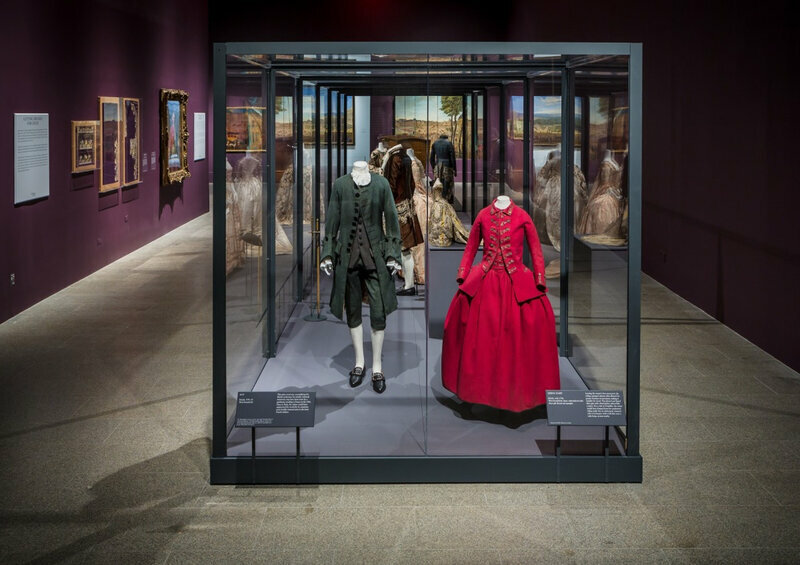 Five galleries with aligned doorways were constructed to emulate the enfilade of rooms, generating a long theatrical vista and a sense of anticipation for the visitor. Custom-designed wallpaper suggests the defining architectural elements of the palace’s interiors—its marble inlays, pilasters, gilded paneling, wall hangings, and mirrors. 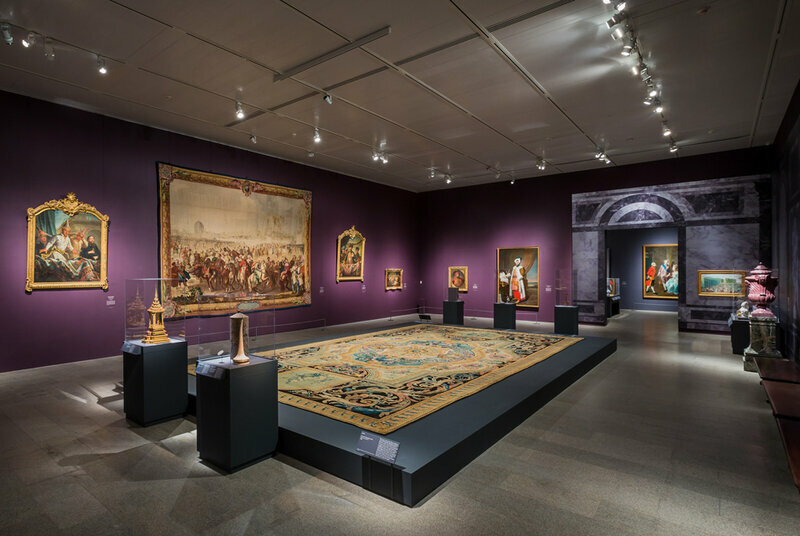 "Visitors to Versailles (1682–1789)" at The Metropolitan Museum of Art, 2018. 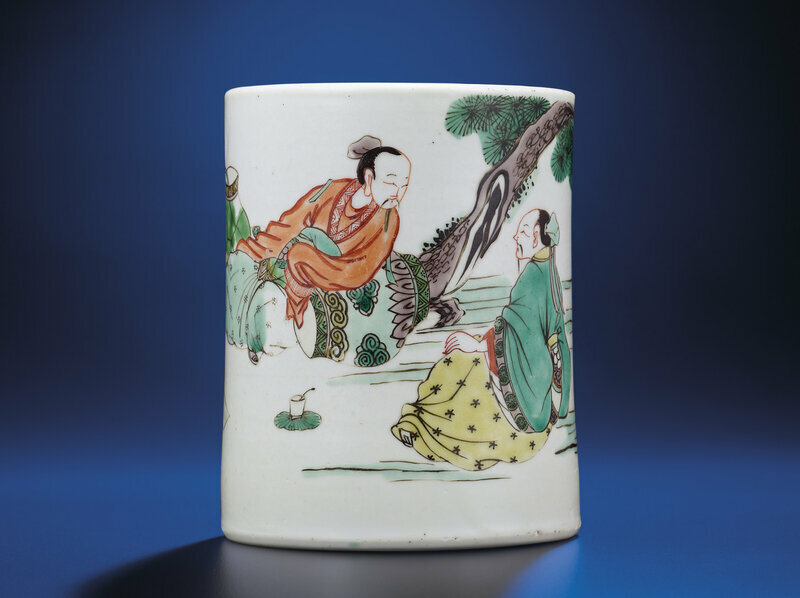 Photo: Courtesy of The Metropolitan Museum of Art.